About the event, I’ll run my first marathon 19th of August this year Reykjavik, Iceland. My setup for this event so far is an iPhone7, a Garmin running watch and 3 mobiles apps: Garmin Connect to sync my watch, Strava to keep track of my pace and My Asics to log my time in my training calendar. Not very handy when you’re training 3 to 4 times a week. Let’s have a look to each of services, one app at a time. I started using Strava a while ago and am really happy with their services. 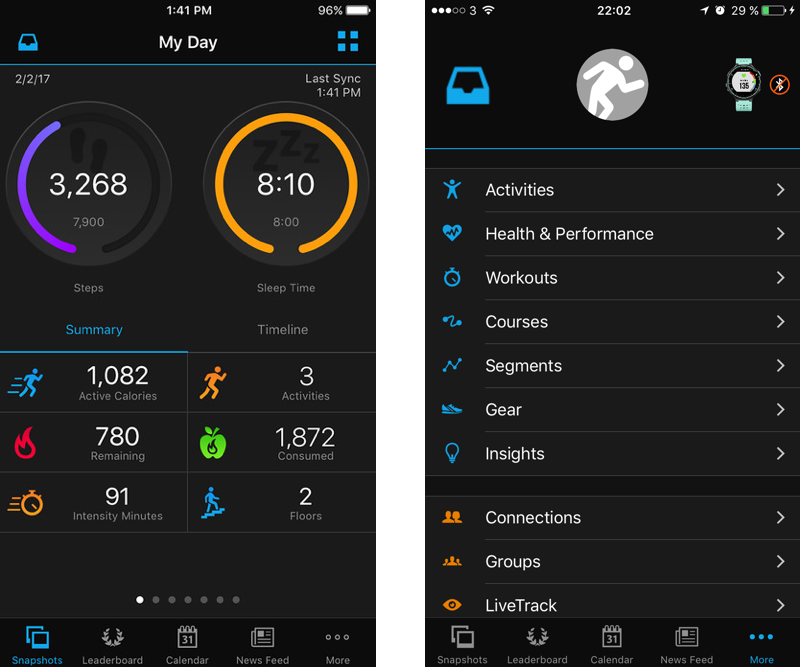 The app manages running, cycling and swimming. The news feed and social network side is really well done. Foreach run you do, you can compare to your last time but also to other friends and challengers. I’s even manage to know if what’s your rank over the year one a dedicated section. Statistics part is also really nice to see, that’s how I discovered I ran over 500miles during 2016. They also have small features like the ability to add your running shoes to keep track of usage and be sure to change it on time. Their widget is really handy to quickly start a run, which is also available as a force touch. Finally I use voice logs to know time and distance every mile run. I don’t have to much to say about it, I’m pretty convinced about this app. Garmin Connect app is mostly required if you use any Garmin smartwatch. However, it’s not really dedicated to running: it includes any kind of activities as cycling, running, fitness equipment, swimming, motorcycling, etc. As most of the new smartphone too, there is the ability to follow sleep, heart rates, calories. In a daily basis, I don’t need this app at all except to sync my watch. However, this app has been designed to work without smartwatch: I guess they wanted to target any users before their own clients, that make the app not really intuitive to use for Garmin smart watch owner. Cool thing about their service is that it’s open to third part. Once my watch is sync, it can be automatically export to my Strava account, which is really nice. 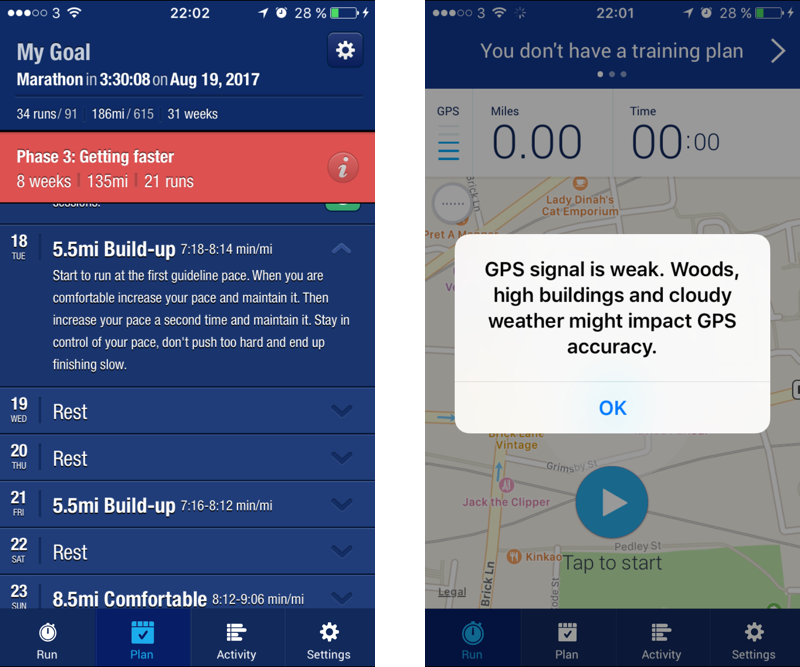 There is not as much as other apps available yet though and they are not always done right: a Garmin activity logged can be renamed on Strava for some strange reasons. Another fun thing is the ability to change the skin of my watch (okay it’s a bonus). 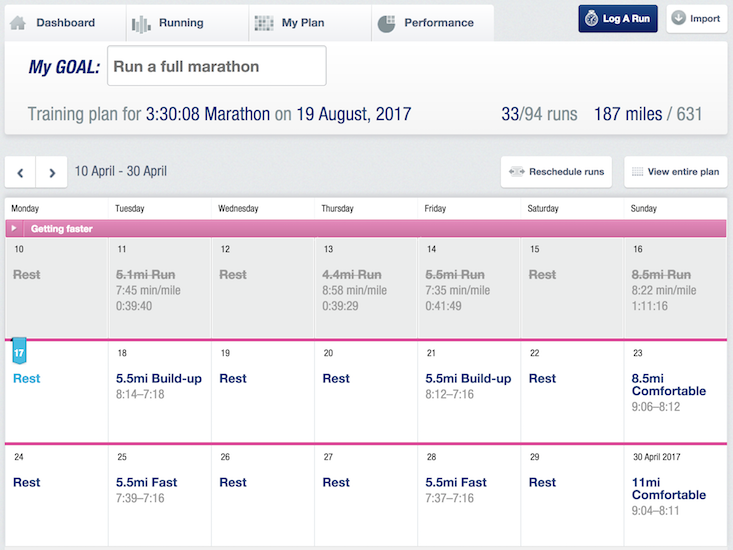 I discovered that Asics has created a free training program that created a dedicated plan based on your age, your running event date and what distance you can run today. Based on those data, it will generate a 5 steps training program based on time left before the event. In it, you have interval time pace foreach of your run and when to rest. This service goes with a mobile app that allows you to track and log each of your run, either manually of based on your GPS. On training day, you can eventually add an email or notification as a reminder to avoid you loose track of it (no excuses!!!). On my side, I already had my setup. However, Asics program doesn’t allow to automatically import or sync log with any other apps. I think they missed a real point when you knows how many people use Runtastic, RunKeeper or Strava. So every time I go for my training, I need to go back to Asics Running and manually log my run. 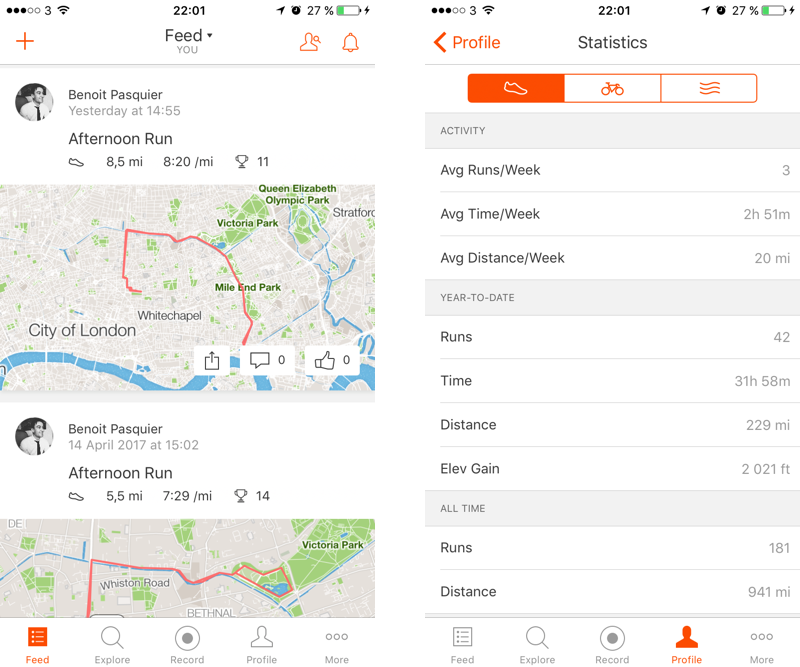 The mobile experience is a bit poor, probably because I already use Strava to track my run. I only check it for my plan and add logs. However the app start with a run view and displays quite often a weak signal popup. A good thing about the training program is their update. They detected that I ran a bit faster and further than they advised me. The platform asked me if I wanted to update my training plan in consequences. It definitely keep me motivated and let me think that they are following my improvements. I think it’s really important to understand how people are going to consume a service to be able to design the app. On my daily usage, even if I would like to follow my heart rate more often, the Garmin Connect experience doesn’t add any value which made me gave up on it for now. I wish that Asics understands a bit better running mobile apps when designing their own to avoid reinvent a new tracking app. 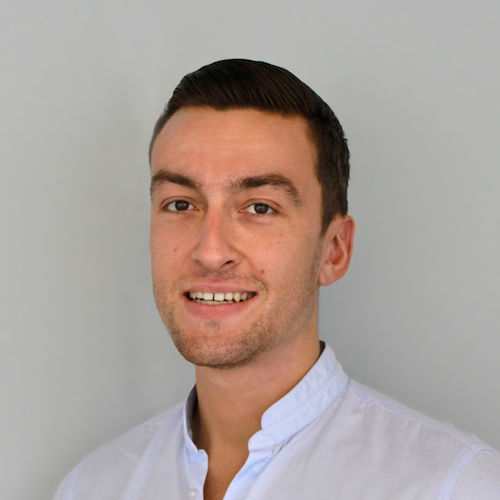 Training for the last 10 weeks between 3 and 4 times for week, I can tell that small frictions can make a huge difference on an user experience perspective and define if users will stick with your app or give up on it. About my training itself, I’ve done a third of it, about 30 runs logged on 91 in total, for about 170 miles run so far, definitely thanks to Asics training program. I’ll be happy to share and update my experience as it goes.